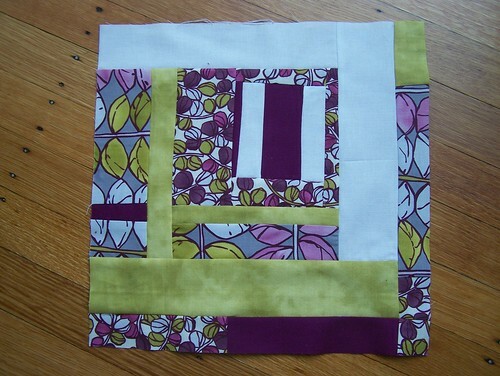 Here's a bee block I whipped up for Tisha for the IMQG bee, in her favorite fabrics. Tisha, I hope you like it and get a good variety of blocks back in the mail! I also wanted to say a big thanks to AnneMarie for featuring me today as part of Gen X Quilters Follower Friday! I love reading AnneMarie's blog, not only because she lives in my hometown of Columbus, Ohio, but because she is a great quilter and an avid fabric lover. 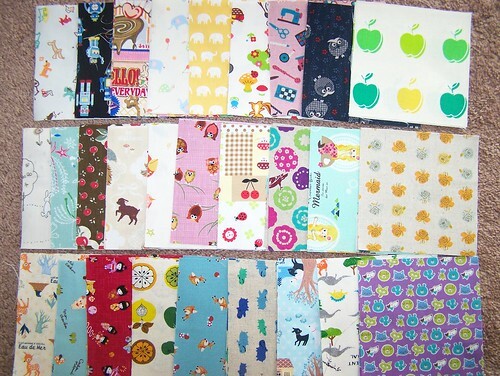 In fact, she's been hosting some fun fabric swaps recently, like the Japanese Imports charm square swap. I was so happy to receive this in my mailbox after returning home from vacation! And thanks AnneMarie for the shout out! such a pretty block, and congrats on the feature! It was fun reading about you over at GenX. Happy we are in the Spoonflower swap together. I love what people are choosing! Very pretty block, the colors are great. Those charm swaps sound so fun! Probably I would hoard all of the charms and be very hesitant to make anything with them b/c I would be so happy just looking at them, ha. I had some unique KOKKA fabric, less than a yard of it, and it took me two years to use it in a project.. eeep!